Unit 102 Theatre Company’s production of David Mamet’s American Buffalo features some of the finest acting in a Mamet play I’ve ever seen in Toronto. Mamet has been praised for his stylized aggressive dialogue, so-called “Mamet speak”, but Brandon Thomas and Dave Lafontaine as the main characters Teach and Don have completely imbued themselves in it so that it becomes so fully natural it seems the two are improvising. It’s an accomplishment that actors at larger theatre companies in Toronto have yet to master. For that reason and for the incisive direction of Luis Fernandes, this is a Mamet production that deserves a wider audience and a longer run than it will receive at the Unit 102 Theatre. Mamet has publicly acknowledged his debt to Harold Pinter, even dedicating his Glengarry Glen Ross (1983) to the British playwright. American Buffalo (1975), Mamet’s breakthrough play, is itself closely related to Pinter’s The Caretaker (1960) in that both are three-man plays in which two characters have a pre-existing relationship, disturbed by the fact that one has invited a third to join them. In both one member of the pair tries to convince the other that the third is an intruder. The important difference is that in Pinter the third character Davies actually is trying to encroach on the lives of two brothers, while in Mamet the third character Bobby is not trying break up the friendship of Teach and Don. In both plays the emphasis is on character, not plot, and on the power games that characters play and the verbal methods they use to attack others and defend or advance their position in the narrow world of the play. American Buffalo is set during one day in Don’s Resale Shop in Chicago. Despite the vague name, what Don runs is a junk shop and designer Adam Belanger has done a great job at making it look as realistically grungy as possible. When the play opens Don (David Lafontaine) has taken a former drug addict Bobby (Aldrin Bundoc) under his wing and is teaching him his philosophy of life. One of the founding principals is “There's business and there's friendship” and the two must be kept separate. The play will go on to demonstrate that none of the characters are able to live by this credo. Don has had the misfortune of selling an American buffalo-head nickel to a customer for a price that he now realizes was too low. He feels humiliated by his lack of knowledge and to rectify the situation, he wants to steal the coin back. For this purpose he has had Bobby scouting out the building where the buyer lives and reporting when he is out. When Teach (Brandon Thomas), Don’s colleague in poker and past petty crime, shows up, Teach is furious that Don plans to entrust the break-in at the buyer’s apartment to a kid like Bobby rather than to him. Mamet gives us ample opportunity to observe that Bobby’s brain has been fried since he can barely remember take-out orders that Don gives him or even things Don has just said. All three low-lifes have limited vocabularies, but Bobby’s is noticeably deficient. When asked to describe what someone is wearing, all he can come up with is “things”. Thus a conflict develops between Teach and Don over Bobby. Don has an almost parental concern for the boy and his trying to give him a better start in the world. Teach views this as a distraction from their “business” and is keen to reinstate himself as Don’s business partner of choice. Even though neither Don nor Teach knows how to break into a building or deal with a safe, Teach is firmly against adding Fletch to the team, even though he has that knowledge. Teach gets his way as far as replacing Bobby and Don gets his way as far as including Fletch, but in Act 2 when Fletch never shows up, Teach takes out his frustration on Bobby to such an extent that Don rejects Teach. The play is thus both a comedy and tragedy at once. The comedy lies primarily in Teach’s attempts to prove his expertise and insight when every effort he makes demonstrates just the opposite. As will become a typical theme for Mamet in his examination of the American male, Teach’s macho stance and know-it-all attitude presents a cover for loneliness. We see, but Teach does not, that his antagonism toward Bobby is not out of concern for “business” but for “friendship” since Don seems to be the only person that Teach can count as a friend. His desire to exclude Bobby and the never-seen Fletch is an attempt to strengthen the bond between him and Don. The tragedy is that his own actions lead to what may be his permanent exile from Don’s friendship. Director Luis Fernandes’ keen insight into what lies beneath the characters’ comically inarticulate dialogue means that Mamet’s themes come to the fore in ways they never did in Soulpepper’s revival of the play in 2006. Fernandes is also an expert at pacing the action so that tension between Teach and Don and his protégé mounts until it finally explodes in Teach’s huge tantrum of rage and frustration in Act 2. As stated in the introduction, the performances of Brandon Thomas and David Lafontaine are beyond praise. They state in the programme that they have always loved this play and that love shows in the nuance they bring to every line. Lafontaine shows us that Don sees the pathetic creature that lies under Teach’s swaggering exterior and has become an expert at how to placate his anger, feed his vanity and disguise his distrust. Thomas gives a tour de force performance as a man propelled through life by egotism tempered with paranoia. His swaggering around the shop is almost like a choreographed act meant to impress others with his personal daring and suavity. His complete meltdown in Act 2 is frightening in its ferocity. In contrast Lafontaine’s Don usually stands motionless, observing Teach’s performance, only ready to attack him when he goes too far in dissing others, especially Bobby. Yet, at the same time he lets us see that Don is all too aware of his own failings. The two actors work superbly together in portraying the funny/sad relationship between the two men where Don has seen through Teach, but Teach is too blind to recognize it. Under Fernandes, Bundoc’s Bobby goes through the action as if in a kind of daze. This suits the effect of his former addiction and explains his seeming inability to pay attention or retain information. This also sets up Bobby as a completely neutral pawn in the power games between Teach and Don. Yet, it does make the play more interesting if Bobby is allowed a bit more personality to make us wonder, along with Teach, whether Bobby might actually be wily enough to double-cross Don. Bundoc plays Bobby well as a burnt-out kid whose inarticulateness disguises not just the animosity he feels for Teach but the total devotion he feels for Don. Bundoc has Bobby seemingly shut himself off when Teach attacks him as if trying to become invisible. This is a powerful production. It’s the first I’ve seen that gets the fine line between comedy and tragedy just right. And it’s also the first to make Mamet’s universal themes effortlessly rise out of the superficially inane dialogue of the three verbally challenged characters. Lovers of Mamet, lovers of fine acting, lovers of both, here’s a show you must not miss. 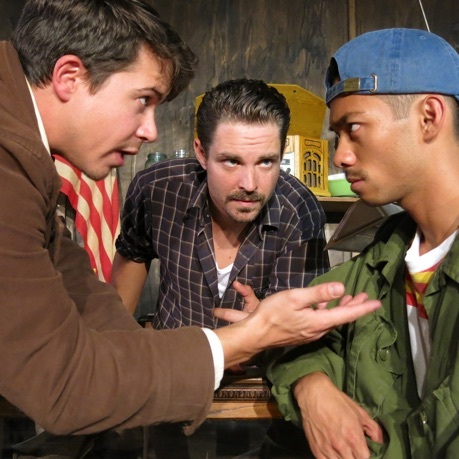 Photos: (from top) Brandon Thomas as Teach and David Lafontaine as Don; Brandon Thomas as Teach, David Lafontaine as Don and Aldrin Bundoc as Bobby. ©2014 Lindsay Junkin.